To view our current inventory of fine antique silver hilt swords, click here! This Great Relic Has Been Sold. Thank you! 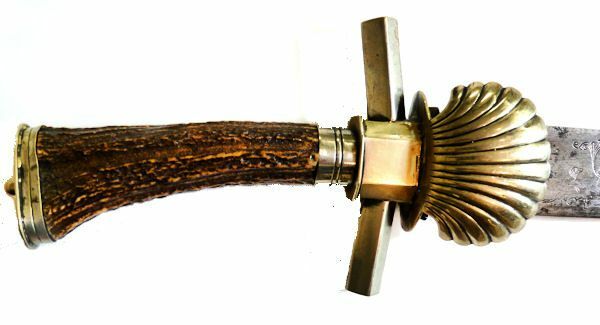 Presented is an exceptional silver hilt hunting sword with the stag horn grip in perfect condition with an engraved single edge flat blade. The obverse blade has a six inch area with a floral design where two hunting dogs are chasing a boar. On the reverse, the two dogs are chasing a stag. On the obverse ricasso there is a rectangular area within which is a geometric design. The 21 1/2" blade has some small areas of pitting and some black marks, but is mostly in good condition. There are no other markings on the sword. The cross guard is made of a near 5/16” x 1 ¼” square length of silver metal set on end which protrudes through a seven sided center piece over which is a banded ½” ferrule. 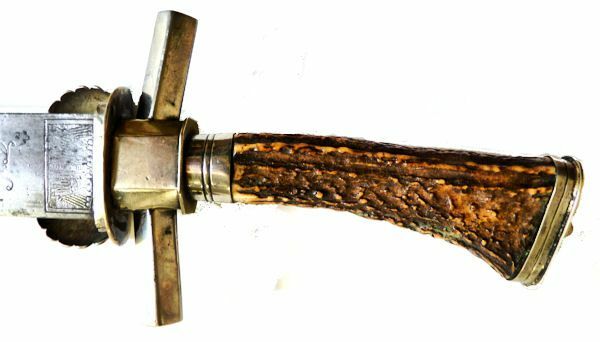 The stag horn 4 ½” grip ends in a flat top pommel with a capstan head on top. Both the British and the French favored the cast vertical style scallop shell guard during the period 1710 -1740. 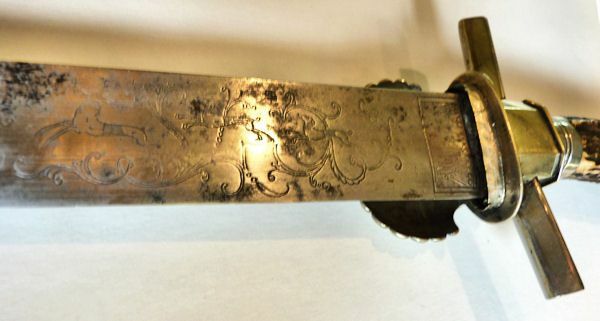 That said, the lack of hallmarks eliminates this being English Sterling, and the preponderance of silver metal tends to make this sword of possible German manufacture, i.e. German Silver or nickel silver. The brown pebbled leather sheath has a large 2 ¾” silver band with throg at its throat, and 4” double pointed band at the end. The seam on the reverse is bonded. It is in perfect condition. 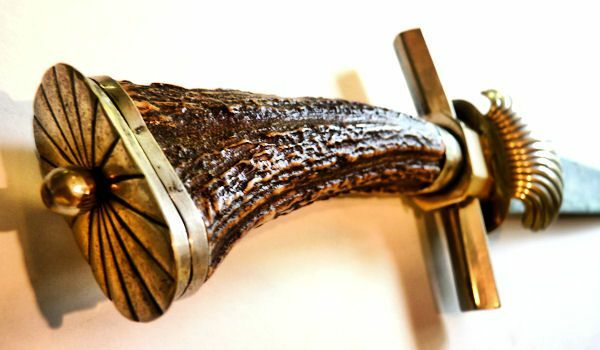 The dramatic hilt pictured above showing both sides, is one of the most beautiful we have ever seen. BLADE:Width 1 1/4" Thickness 1/4" Length 21 1/2" False edge: 4"
The flat pommel cap has a sunburst pattern, and simple capstan terminus. The reverse shows the rectangle on the ricasso with geometric design followed by two hunting dogs chasing a stag, with floral design surrounding. This rare sword offers a unique opportunity to acquire a historic silver craft of great skill done by an unknown hand. International buyers welcome, but must inquire first. You are responsible for knowing the import laws of your country. We have satisfied customers in Argentina, Australia, Austria, Belgium, Bermuda, British Virgin Islands, Canada, Chile, China, Czech Republic, Democratic Republic of Congo, Denmark, Estonia, England, France, Germany, Greece, Holland, Hong Kong, Hungary, Iceland, Indonesia, Ireland, Israel, Italy, Japan, Kuwait, Latvia, Luxembourg, Malaysia, Martinique, Mexico, New Zealand, Nigeria, Norway, Nova Scotia, Panama, Philippines, Poland, Portugal, Puerto Rico, Romania, Russia, Saudi Arabia, Scotland, Singapore, South Africa, Spain, St. Maarten, Sweden, Switzerland, Thailand, Turkey, United Arab Emirates, USVI and the Eastern Caribbean.